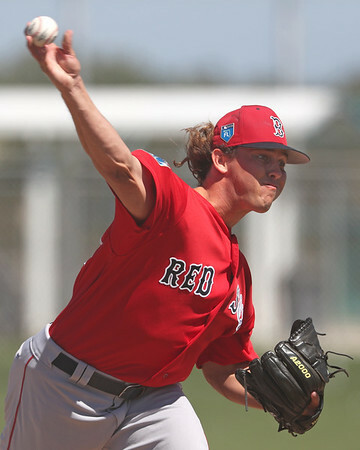 Chaz Fiorino wrote SoxProspects' latest Notes from the Field, giving scouting reports on this week's pitcher of the week Kutter Crawford (pictured) and last year's third-round pick, infielder Brett Netzer. The weather has not been good to the Northeast, as Portland has had six postponements this year, five of which were at home. The rain has been so bad in Maine that when combined with redoing the infield dirt, the Sea Dogs' entire series with Reading was washed out. Pawtucket has had slightly better luck, with only three postponements, including Opening Day being moved due to snow. 4/30 Cup of Coffee: Things appear to be turning around for the Greenville Drive, who took their series against Charleston with another top-notch outing from Kutter Crawford (pictured). The PawSox were two-hit on a bitter day in Buffalo, while the Sea Dogs were again victims of the weather. A solid start from William Cuevas went for naught, as a trio of Bison hurlers held the PawSox to just two hits. Cuevas allowed two runs on six hits in 5 1/3, striking out six and walking only one. Brandon Workman worked 1 2/3 scoreless in his first appearance in six days, and Josh Smith threw a scoreless ninth to drop his ERA to 0.79. 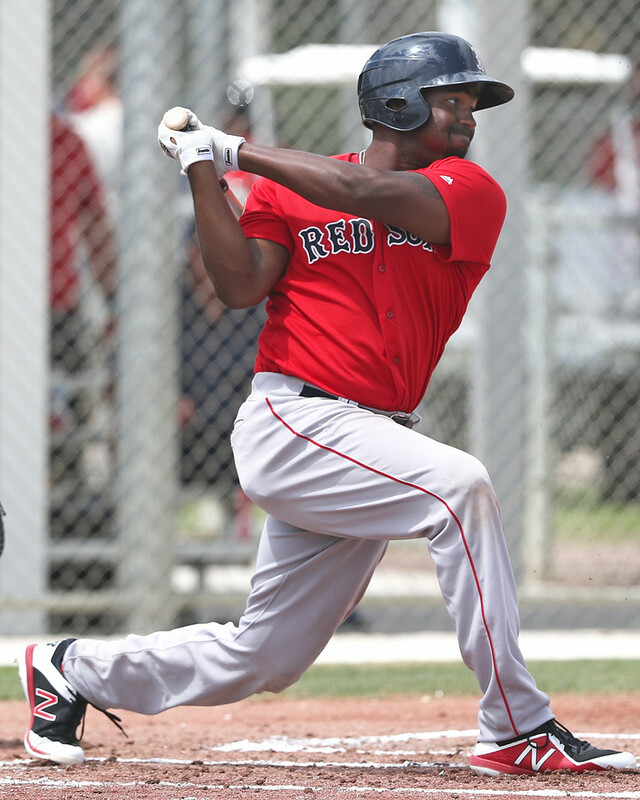 Unsurprisingly, Rusney Castillo picked up one of the two Pawtucket knocks. The veteran outfielder continues to pace the squad in several offensive categories, including an organization-leading 28 hits. 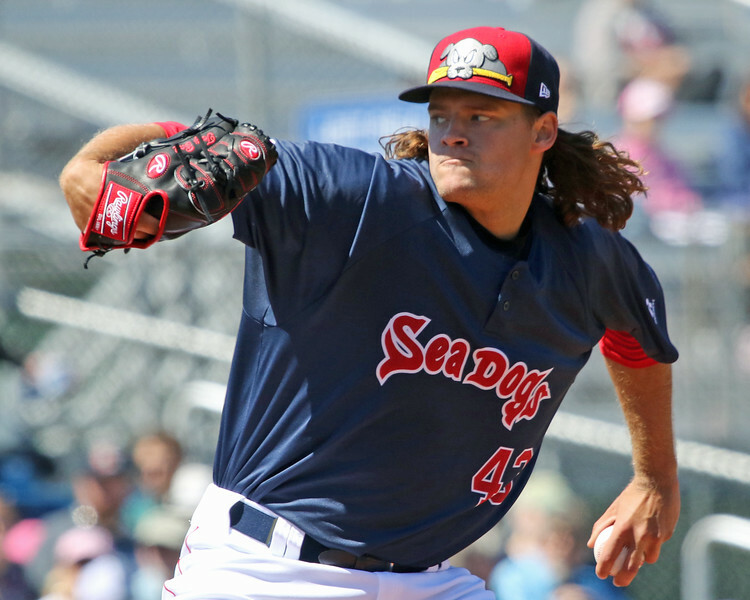 4/29 Cup of Coffee: Another dazzling performance from left-hander Jalen Beeks secured the win for the PawSox, while the Red Sox and Drive both took losses and the Sea Dogs were postponed for the second straight day. Jalen Beeks continues to be the story of the season so far, as he struck out 11 in 5 2/3 innings to pace the PawSox to a win over the Bisons. Beeks allowed only three hits and two runs while issuing one walk. He threw 64 of his 93 pitches for strikes and didn't allow an extra-base hit. It was his second win of the year as Beeks' ERA dropped to 1.37. Jordan Betts belted a bases-clearing double in the top of the six to break things open in a four-run inning for the PawSox, making it 5-0 at the time. Ivan De Jesus Jr. singled home Mike Ohlman in the top of the ninth to cap off a 3-for-5 day for the second baseman. The team had a total of 12 hits in the win with Jeremy Barfield and Chad De La Guerra the lone two players without a base knock. 4/28 Cup of Coffee: A big offensive performance from Rusney Castillo helped the PawSox overcome a shaky outing from Steven Wright, while Roniel Raudes (pictured, right) pitched a gem for Salem. Greenville snapped a long losing streak with a big comeback, though Alex Scherff continued to struggle. The PawSox blasted three home runs and Rusney Castillo had his best game of the season as Pawtucket came out on top in a slugfest. 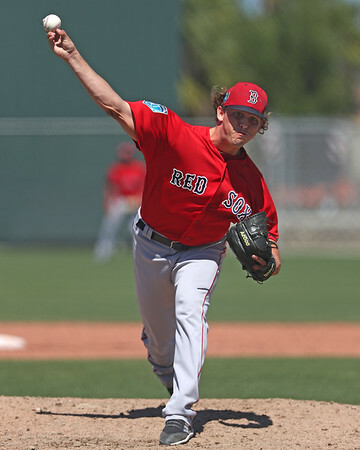 Steven Wright was cruising through five innings in his second rehab start, but he hit a wall in the sixth as he allowed the first four batters to reach base without recording an out before he was pulled. All four eventually came in to score, and he ended the day with five runs allowed over five innings, with a walk and four strikeouts. Marcus Walden allowed the inherited runners to score in his first appearance since being optioned on April 20. At the end of March, the SoxProspects Staff made their annual trip to Minor League Spring Training. Over the next few weeks their notes and observations will be featured on SoxProspects News. 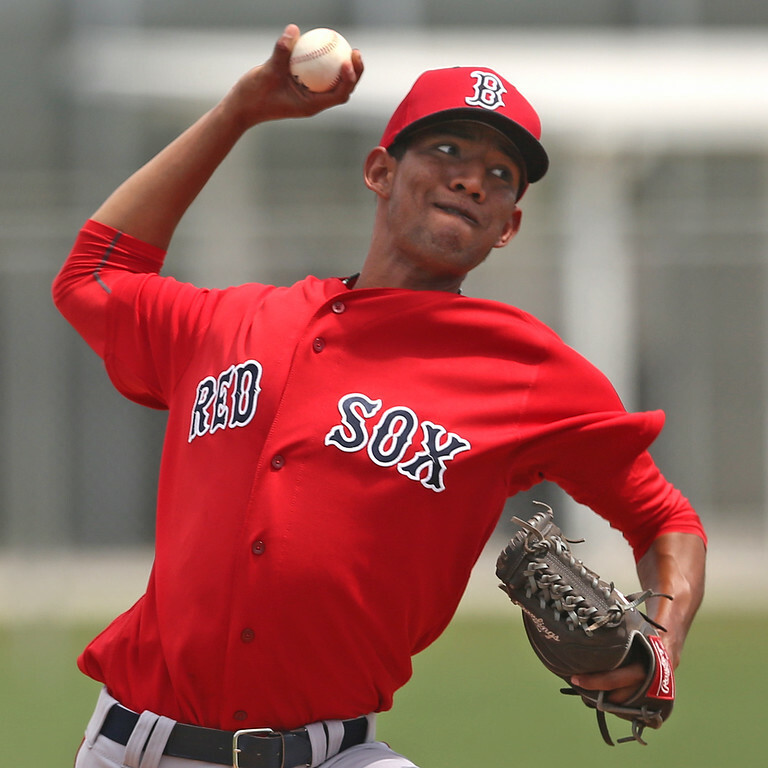 Here is the eighth feature from Spring Training highlighting five more Red Sox prospects. 6-foot-1, 190-pound right-hander Kutter Crawford the club’s sixteenth-round selection in 2017, signing for $125,000 out of Florida Gulf Coast University in Fort Myers. Crawford threw three innings, striking out four hitters including striking out the side in his first inning of work. There is effort in his delivery, and his four-pitch mix flattened considerably while his command faltered after the first inning, indicating a relief profile down the road. Crawford’s fastball was 91-93 mph, complemented by a cutter at 85-87 mph, a curveball at 77-78 mph, and a changeup that was thrown sparingly and tough to distinguish from the cutter because of its similar velocity. It’s a fringe-average package across the board, with the cutter, coincidentally his go-to pitch, showing hard, late cutting action. 6-foot, 195 pound second baseman Brett Netzer was drafted in the third round of the 2017 draft and signed for $475,000. In a very limited look, Netzer appeared to have a quick, smooth, line drive stroke from the left side with bat control and the ability to recognize spin. In his first at-bat during a game, he was in a 2-2 count and stayed right on curveball that was up-and-away, spraying a line drive to left-field for a hit. Netzer also impressed with his soft hands and actions at second base taking ground balls during morning workouts. However, his average arm, average speed and fringe power gives him a second base-only profile, putting lots of pressure on the hit tool. He opened the year in High A Salem. 4/27 Cup of Coffee: It was poised to be a light night on the farm with Pawtucket and Portland having scheduled off days, but there were plenty of intriguing performances in the lower levels. Bobby Dalbec and Bryan Mata helped lead Salem, while Enmanuel De Jesus (pictured, right) and Lorenzo Cedrola came up to help Greenville get back on track. Two doubles from Bobby Dalbec and a solid performance from Bryan Mata highlighted Salem's victory. Mata only went four innings but he did not allow a run and surrendered one hit. His control issues were still present as he walked two and hit two batters, but he also induced eight groundouts without allowing a fly out. Daniel Gonzalez improved to 3-0 with three innings of two-run ball, and Matthew Gorst picked up his second save with 1 1/3 scoreless innings. Gorst has now allowed two runs and struck out 12 over 10 2/3 innings to start the year. 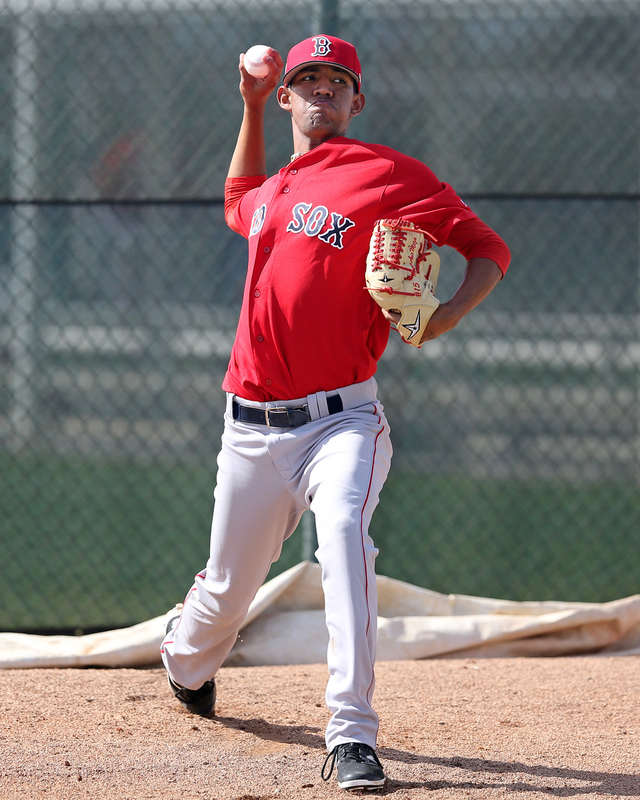 SoxProspects.com Assistant Director of Scouting Chad Fiorino continued his Notes from the Field series with notes from players from spring training. Wednesday's edition focused on two pitchers in their early 20s in right-hander Roniel Raudes (pictured, right) and lefty Jhonathan Diaz. 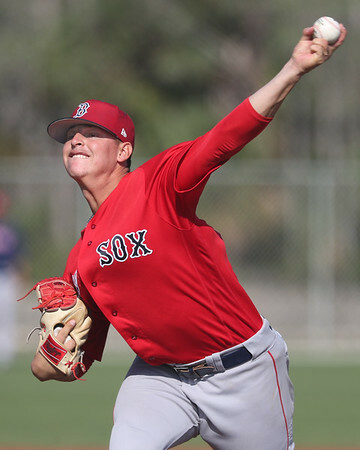 Raudes, ranked 11th in the SoxProspects.com rankings has made four starts this season for Salem with a 3.79 ERA, 1.42 WHIP and 13 strikeouts to nine walks over 19 innings. Diaz, pitching for Greenville, has also made four starts and over 21 2/3 innings of work he has a worse ERA at 4.57 but better secondary numbers with a 1.20 WHIP, 21 strikeouts, and five walks. 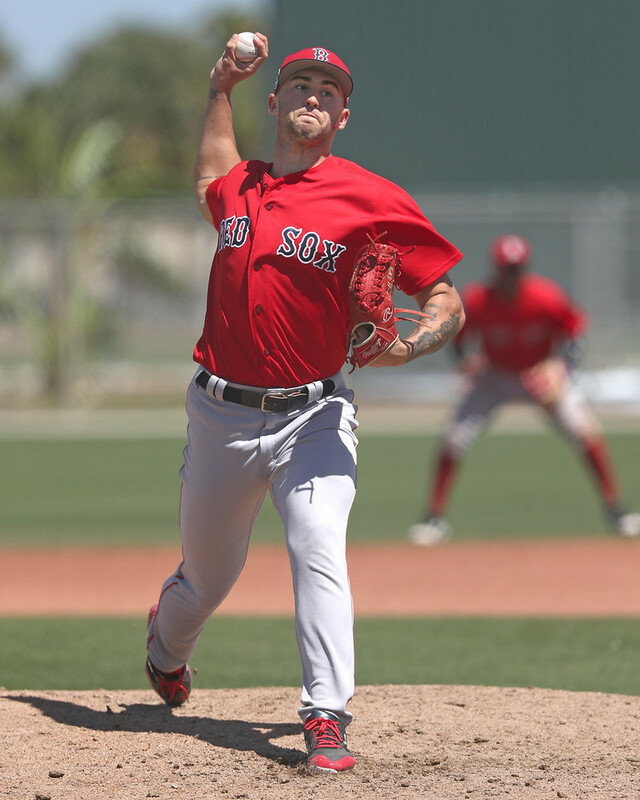 Do you like how former top prospect Blake Swihart has been used while up with the big league club? Yeah, Chris Hatfield and Ian Cundall don't approve either and that is just one of several topics discussed on the glorious return of the SoxProspects.com podcast after a short hiatus. 4/26 Cup of Coffee: Rain was a big theme on Wednesday, as Salem swept its doubleheader, while Greenville was swept in a twin bill of their own. Both were caused by rainouts on Tuesday, while Portland's game ended early due to weather and Pawtucket's never happened at all. Darwinzon Hernandez (pictured) led Salem in Game 1, and Brett Netzer had two hits in each game for Salem. The PawSox and Mud Hens saw the final game of their three-game get canceled at 12:30 p.m. on Wednesday. The two teams will not meet again this year so the game will not be made up. In a rain-shortened contest, Portland could only muster three hits, one each from Cole Sturgeon, Lule Tendler and Austin Rei. Mike Shawaryn pitched five-plus innings, and through five, he had allowed only one hit with seven strikeouts. However, after three consecutive singles, the Yard Goats had scored once and had two runners on. On a sacrifice bunt attempt, Shawaryn threw the ball away, and on the next batter, Josh Ockimey made another error, each scoring a run. That was the last play of the game, as the game was called after a rain delay. With hits in five of his last six games, Sturgeon has slashed .369/.447/.569 to begin the year. At the end of March, the SoxProspects Staff made their annual trip to Minor League Spring Training. Over the next few weeks their notes and observations will be featured on SoxProspects News. 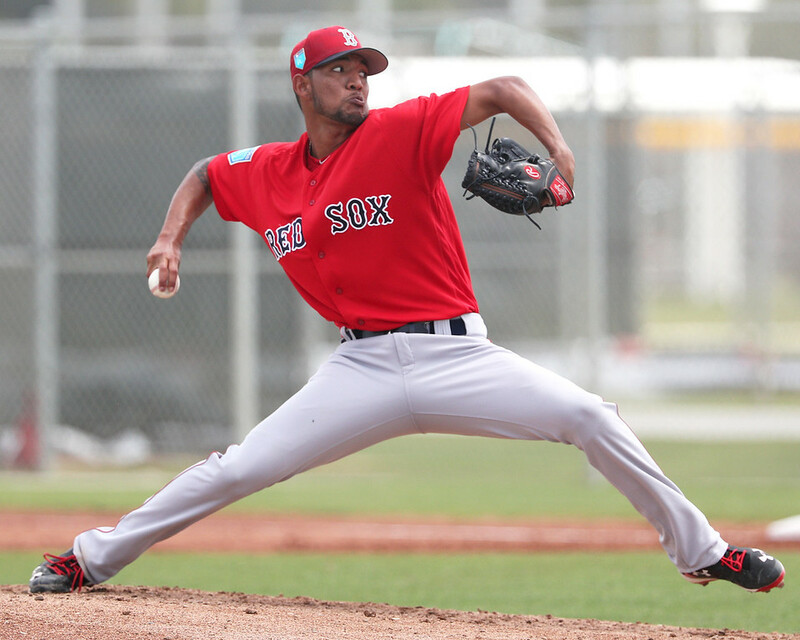 Here is the seventh feature from Spring Training highlighting two more intriguing Red Sox starting pitching prospects. 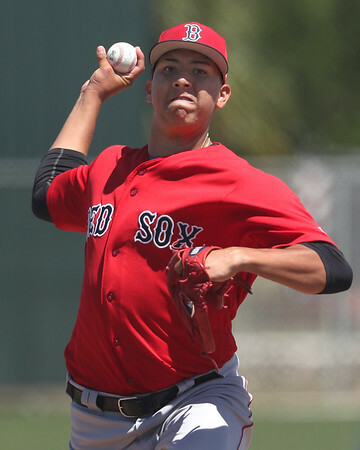 Roniel Raudes threw five innings in the High-A Salem game facing Rays minor leaguers. It was one of the standout performances of the trip for me, as Raudes struck out six hitters, elicited 11 swinging strikes, and missed bats with all four pitches. The undersized right-hander is listed at 6-foot-1, 160 pounds. I suspect he’s a bit heavier and stronger than listed, and given that he is still just 20 years old, there’s still some physical projection. Raudes’ delivery immediately stands out—he will often crouch down and swirl his hands around his head in a circular motion pre-wind-up. Surprisingly enough, it does create some deception and seems to disrupt the timing of hitters. He doesn’t do it every pitch, and will other times just go straight into his delivery, so hitters are left wondering whether he’s going to do it or not, disrupting their timing and concentration with his varying looks and times to the plate. 4/25 Cup of Coffee: It was a tough night on the farm, as the three affiliates who weather permitted to play were swept. Fortunately, some noteworthy individual performances shone through. 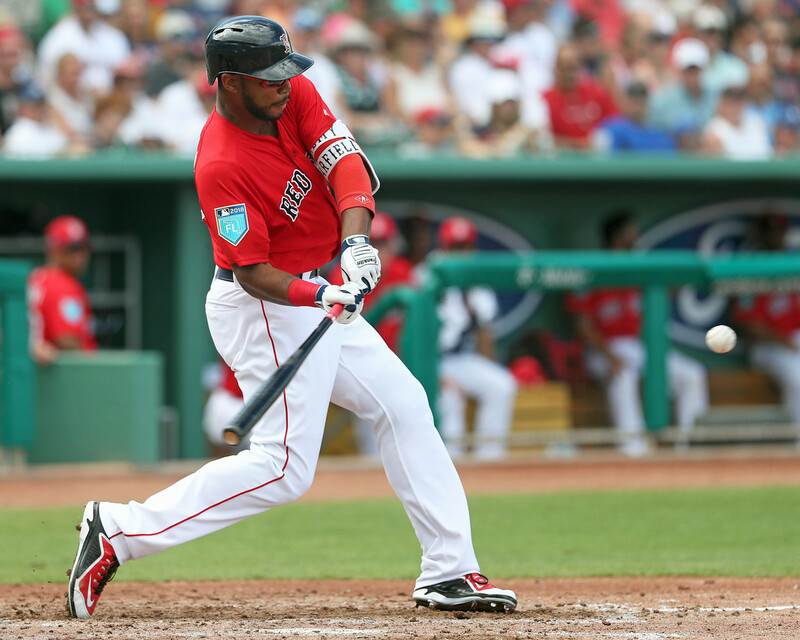 Most pertinently to the major league squad, Xander Bogaerts homered in his first rehab appearance as he ramps back up after suffering an ankle injury two weeks ago. Kutter Crawford (pictured) was outstanding on the mound for Greenville once again, and Travis Lakins was solid in his 2018 debut for the Sea Dogs. Xander Bogaerts showed no signs of rust in his return to competition. Bogaerts blasted a solo home run in the fourth and a leadoff double in the sixth, and also started a 6-4-3 double play. He was removed for Ivan DeJesus in the seventh, but it appears to have been a scheduled substitution rather than injury related, as Bogaerts' ankle showed no ill effects while he ran the bases. Justin Haley surrendered five runs in six innings to take the loss. Ty Buttrey allowed a pair of runs (one earned) in his two innings, but he did strikeout five without issuing a walk. The big right-hander now has struck out 21 of the 47 batters he has faced this season, and has walked only three batters. 4/24 Cup of Coffee: An extra-inning grand slam from Mike Olt (pictured) provided some fireworks for those that stayed to watch the second game of a doubleheader at McCoy Stadium as the four-run homer from Olt powered the PawSox to a 6-4 win over the Toledo Mud Hens. The Sea Dogs didn't fare as well in extra innings, with a comeback effort falling short against the Hartford Yard Goats. Rusney Castillo doubled to open the bottom of the first, but the PawSox wouldn't register another hit as two pitchers for the Mud Hens recorded 21 consecutive outs in a shutout loss for Pawtucket in Game 1 of a doubleheader at McCoy Stadium. Old friend Jarrod Saltalamacchia went 2 for 3 with a double for Toledo. 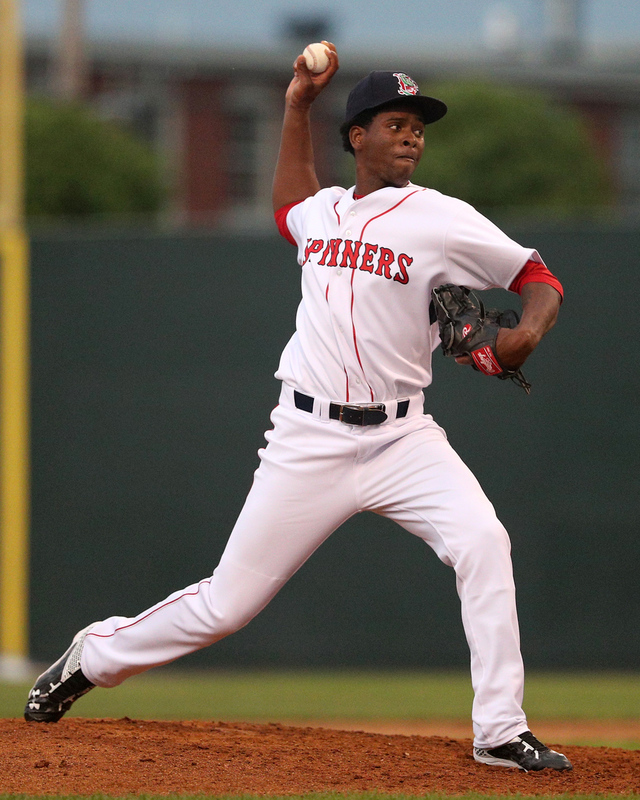 Chandler Shepherd picked up his first loss of the season for the PawSox. The 25-year-old right-hander pitched six innings, allowing five hits and three runs while striking out six. Shepherd allowed two home runs. Playing as the away team in a makeup game from April 15, Mike Olt blasted a grand slam in extra innings to push the PawSox to a split of the doubleheader with Toledo. With Castillo starting the eighth inning on second base, Ramon Flores walked, and Sam Travis was hit by a pitch. Olt then smacked a home run to left center field. After just one base knock in the first game of the twin-bill, the PawSox garnered seven total hits with Olt and Chad De La Guerra the two players with multi-hit games. Brandon Workman got the win while Bobby Poyner, in his first appearance since coming off of the disabled list and being optioned to Triple-A, allowed two runs (one earned) in an inning of relief. 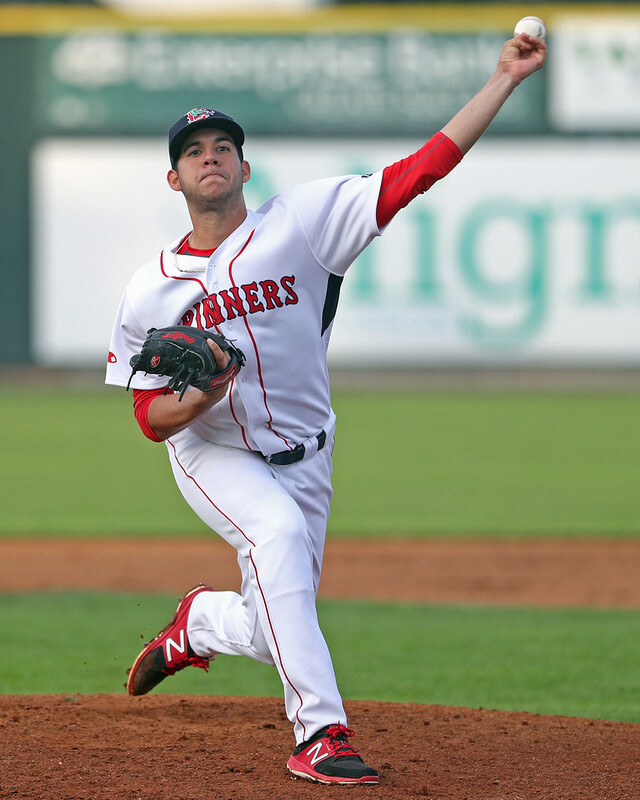 In one of our latest Notes from the Field entries, SoxProspects.com Director of Scouting Ian Cundall featured two Greenville relievers in Brendan Nail and Devon Fisher. Cundall also gave an in-depth look into four older Latin American arms from the 2016-17 signing period. 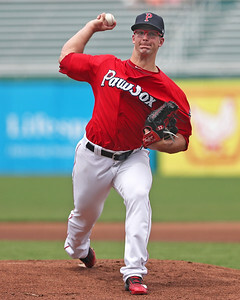 Bobby Poyner (pictured) was activated from the major league disabled list and optioned to Triple-A Pawtucket on Sunday. He pitched seven innings with the Red Sox this season, sporting a 2.57 ERA with eight hits and eight strikeouts. 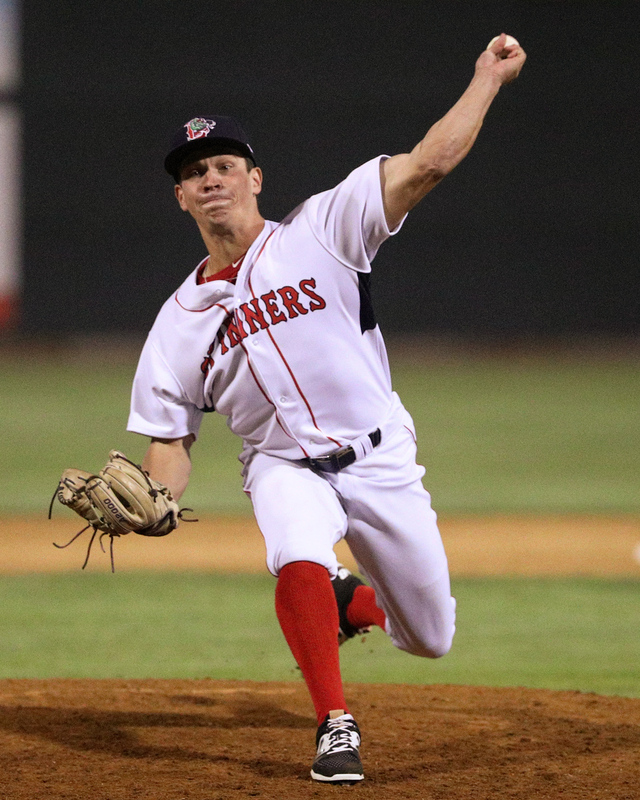 Poyner pitched a scoreless inning of relief on Saturday for the PawSox in his second rehab assignment for a left hamstring strain before his activation. The PawSox had quite the come-from-behind win in extra innings on Sunday, plating four runs in the bottom of the 11th inning to claim a 10-9 walk-off win over the Gwinett Stripers. Mike Miller's RBI single scored Aneury Tavarez in a wild contest. At the end of March, the SoxProspects Staff made their annual trip to Minor League Spring Training. Over the next few weeks their notes and observations will be featured on SoxProspects News. Here is the sixth edition of Notes from the Field from Spring Training 2018 highlighting two more Greenville relievers and several 2017 international signees. 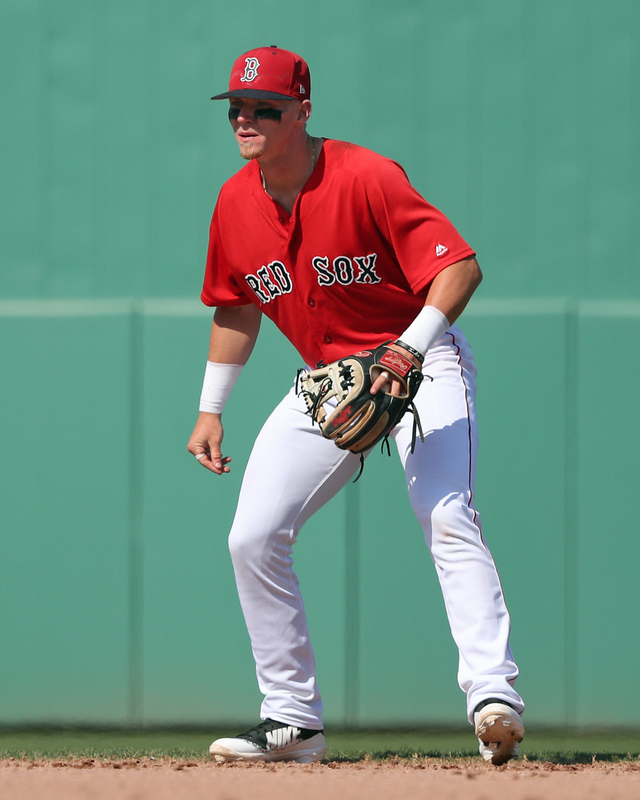 Though he went undrafted out of Western Carolina as a junior last year, left-hander Brendan Nail signed for $125,000 after a strong Cape Cod League season, that mark significantly representing the most the Red Sox could pay him without his bonus counting toward its draft signing bonus cap. Nail has an average frame and starts on the first base side of the rubber. He throws exclusively from the stretch from a high three-quarters arm slot with short arm action behind. He does a good job hiding the ball with his body and was tough for hitters to pick up, especially left-handers. Nail’s stuff does not stand out, however, so command and deception are how he will have to succeed. His fastball sat 86-89 mph and showed cut. He mixed in a breaking ball at 75-80 mph that looked like a curveball at lower velocities and more like a slider when thrown harder. 4/23 Cup of Coffee: All four affiliates were in action Sunday, with two games apiece fitting into opposite extremes. 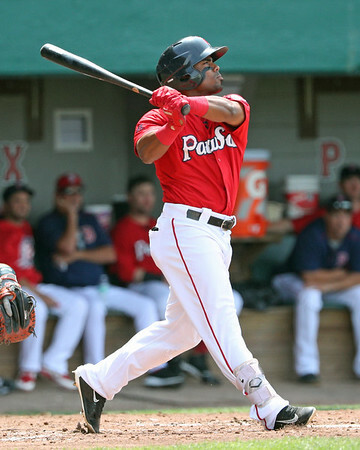 Pawtucket and Salem both won thrilling back-and-forth contests in extra innings, with Aneury Tavarez (pictured) and Bobby Dalbec playing outsized roles in the victories of their respective teams. On the opposite end were Portland and Greenville, for whom nothing seemed to go right and the offense of both squads managed just one run on two hits. In a wild back-and-forth contest, that featured a triple play, Pawtucket scored four times in the bottom of the 11th to race with a victory at McCoy Stadium. Aneury Tavarez played a key role in the win, ripping his second double off the day to tie the contest at nine, and then scoring the winning run on a Mike Miller base hit. Taverez was 3 for 5 in all, driving in two and scoring two. Catcher Mike Ohlman also had a two-run double in the 11th as part of his 2-for-5 afternoon. In a rare feat in such a high-scoring affair, William Cuevas actually turned in a quality start. He allowed eight hits in his six innings of work but was able to pitch out of jams, surrendering only two runs. 4/22 Cup of Coffee: By helping the PawSox to a 6-0 victory over the Stripers, Jalen Beeks (pictured, left) picked up his first win of the season while extending his streak of not allowing an earned run to 13-consecutive innings. Rusney Castillo scored two runs in the win as the PawSox climbed over the .500 mark with a 7-6 overall record. The other three teams in the system all lost as both the Sea Dogs and Red Sox squandered solid starting pitching performances while Alex Scherff and the Drive continued their struggles. Jalen Beeks continued his impressive start to the season by striking out 10 in six innings of work to lead the PawSox to a shutout win over the Stripers. The left-hander, a 12th round draft pick out of the University of Arkansas in 2014, lowered his ERA to 0.64 after allowing just two hits on 98 pitches. Bobby Poyner, Brandon Workman, and Williams Jerez tossed an inning apiece of scoreless relief to preserve the shutout. The PawSox made good use of their six hits as Rusney Castillo was the lone player with multiple base hits, going 2 for 4 with a double and two runs scored. Dan Butler added a double and three walks to the offensive tally. The PawSox were up 2-0 after the first inning before pouring on four runs in the bottom half of the eighth. 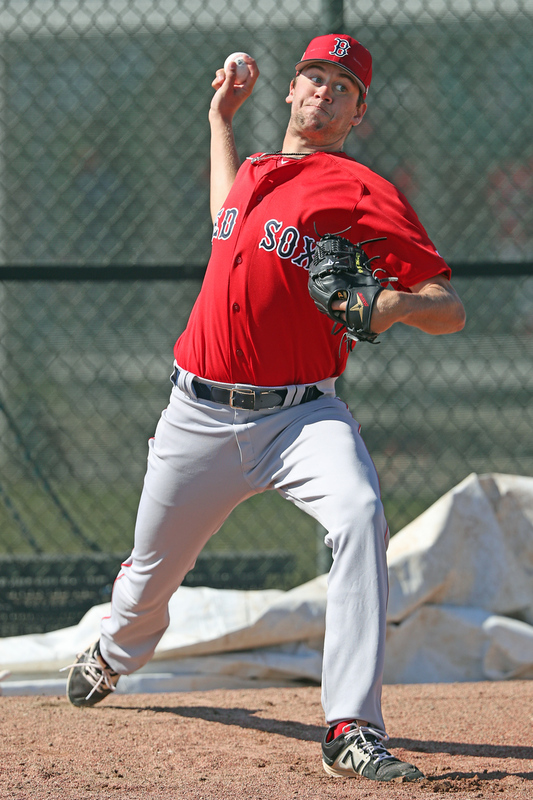 4/21 Cup of Coffee: Steven Wright's rehab appearance did not go as planned as the right-hander had to leave early due to a back injury, but Pawtucket stayed in the game and won thanks to strong nights from Mike Olt (pictured) and Sam Travis. Mike Shawaryn turned in a quality start for the Sea Dogs while Bryan Mata's control issues continued in Salem. A walk-off double from Mike Olt capped an impressive PawSox comeback. 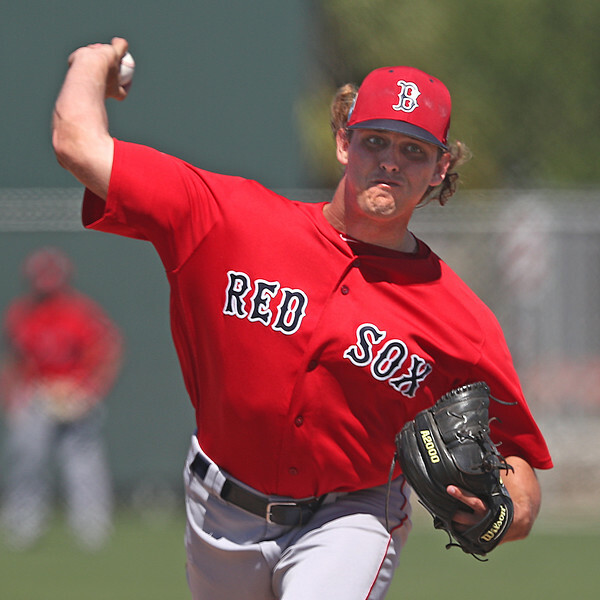 Steven Wright, who underwent left knee surgery last May, made his first rehab appearance but it was cut short due to a stiff back. He had gone the first 2 2/3 innings while allowing three runs on two hits. Josh Smith followed by striking out six over 3 1/3 innings of one-run ball, and Ryan Brasier picked up his first win of the season with two scoreless innings. 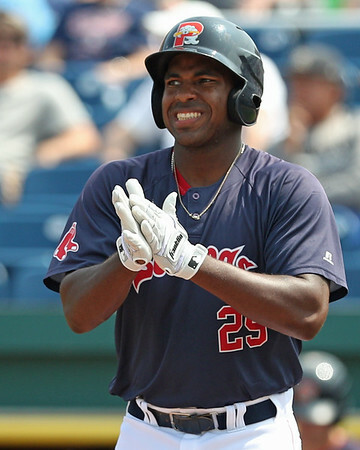 4/20 Cup of Coffee: It was a welcome sight at Portland, as Josh Ockimey (pictured) cleared the bases for his first home run of the year as part of a three-hit night to propel Portland to this win. Tanner Houck struggled in his third start of the season, while Greenville fell against Kannapolis desipte a big night from Michael Osinski. Two days after making his 2018 debut, Josh Ockimey capped a big afternoon with a 411-foot grand slam for his first homer of the season to propel the Sea Dogs. It was the third hit of the day for Ockimey, who missed the first 10 games of the season with a minor hamstring injury. Cole Sturgeon and Esteban Quiroz have been the offensive catalysts in the early going for Portland, and both contributed on Thursday. The day after his hitting streak ended at nine games, Sturgeon doubled, walked, and scored a pair. Quiroz ripped an RBI double, his seventh extra-base hit in 12 games. 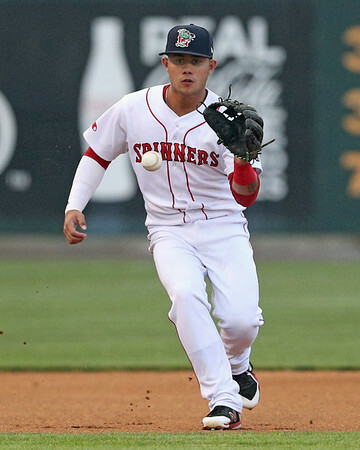 In the latest Notes from the Field, SoxProspects.com Director of Scouting Ian Cundall covered Hunter Haworth, Lukas Young, and Angel Padron. The three Greenville pitchers are all getting their first taste of full-season ball, with Young and Padron off to strong starts. Cundall followed that up with another article focusing on some of the system's younger arms, with Juan Florentino, Andres Jimenez, Oddanier Mosqueda, and Edilson Batista all showing some intrigue. 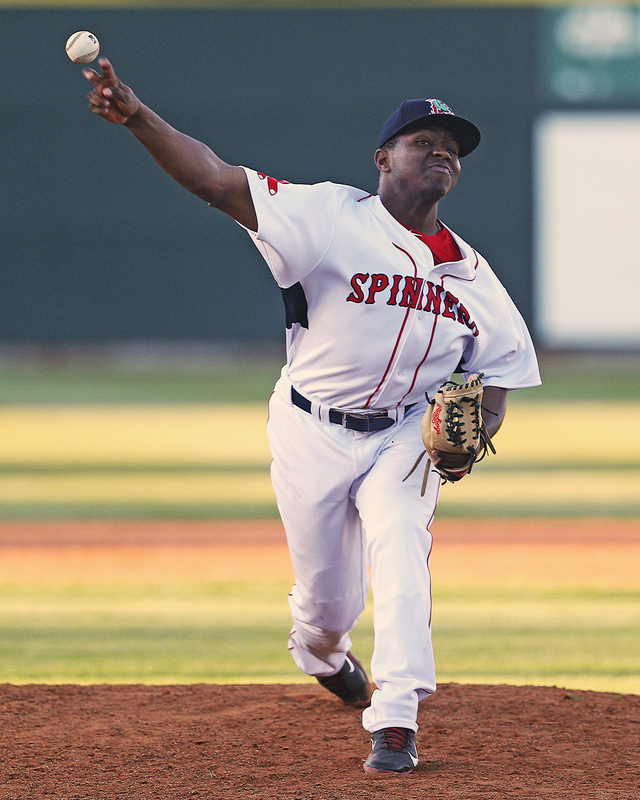 Ninth-ranked prospect Josh Ockimey (pictured, right) was activated from the disabled list on Tuesday and made his season debut for the Portland Sea Dogs. A trio of catchers were on the move early in the week as Isaias Lucena was called up to Portland from Greenville to fill in for Jordan Procyshen who was placed on the disabled list. Charlie Madden was activated off the disabled list for Greenville to replace Lucena. In keeping with the catching theme, Christopher Smith of MassLive.com caught up with Red Sox minor league catching coordinator Chad Epperson, and they discussed Roldani Baldwin, Jhon Nunez, Samuel Miranda and Austin Rei. With the minor league rules continuing to change, the effect on the players is starting to come out. Some players on the Drive have expressed their frustration with the new mound visit rules to Jim Rice of the Greenville News. Brandon Moss returned to Portland on Wednesday to commemorate the 25th anniversary of Portland's first home game. After making his major league debut with the Red Sox in 2007, Moss has played parts of 11 years in the big leagues, though he is currently a free agent. Moss was also honored by being named to the Portland Sea Dogs All-Time Team, which includes the team's time as an affiliate of the Marlins and Red Sox. Joining him on the team is Charles Johnson, Kevin Millar, Dustin Pedroia, Kevin Youkilis, Hanley Ramirez, Andrew Benintendi, Jacoby Ellsbury, Josh Beckett, Jonathan Papelbon, Jon Lester, and Daniel Bard, with Carlos Tosca as the manager. At the end of March, the SoxProspects Staff made their annual trip to Minor League Spring Training. Over the next few weeks their notes and observations will be featured on SoxProspects News. Here is the fifth edition of Notes from the Field from Spring Training 2018 taking a look at four more young arms. 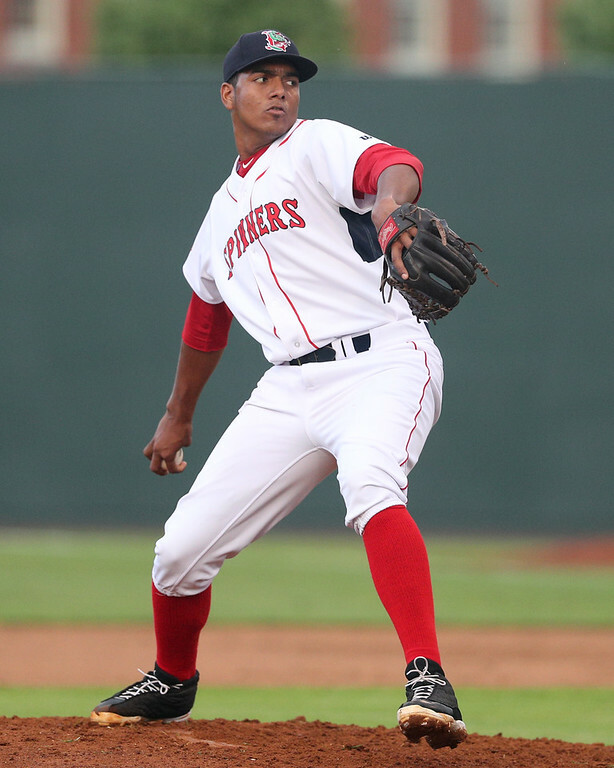 Dominican right-hander Juan Florentino was one of the bullpen standouts in the lower minors last year, putting up a 0.96 ERA with 25 strikeouts to only 2 walks in 18 2/3 innings in Lowell, them moving up to Greenville and posting a 2.12 ERA and 18 strikeouts to 4 walks in 17 innings in Greenville. Last year, Florentino’s fastball sat 93-95 mph, but this spring his velocity was down to 89-91 mph. The drop in velocity may have been because this look was in a simulated game, so he may not have had the same adrenaline as he would if he were facing opposing hitters. Alternatively, he may have been working on his secondary pitches and fastball command and wasn’t airing it out. However, that he was placed back in Greenville to start the 2018 season after a very successful stint in Low A last year—plus that his partner-in-crime in Joan Martinez, who similarly dominated the two levels with Florentino, did receive a promotion to Salem—suggests that perhaps the velocity drop was consistent, and his performance this season in this relatively conservative placement bears watching. 4/19 Cup of Coffee: It was a rough day for the Red Sox minor league system, as the four teams each took a loss. Jeremy Rivera (pictured) led the system with four RBI, while Justin Haley had a strong outing for Pawtucket. Sam Travis and Jantzen Witte each had two-hit outings, but Pawtucket was shut out despite getting two in scoring position in the ninth inning. Justin Haley allowed just four hits in 6 1/3 innings, but his throwing error with one down in the sixth put a runner on third, allowing a sacrifice fly to become the difference. Haley struck out seven and walked one. Ty Buttrey pitched 1 2/3 perfect innings with four strikeouts as well. Travis now has five consecutive multi-hit performances. 4/18 Cup of Coffee: While the major league squad was beginning a west coast swing, the minor league affiliates stepped up to fill the primetime slot in the schedule. 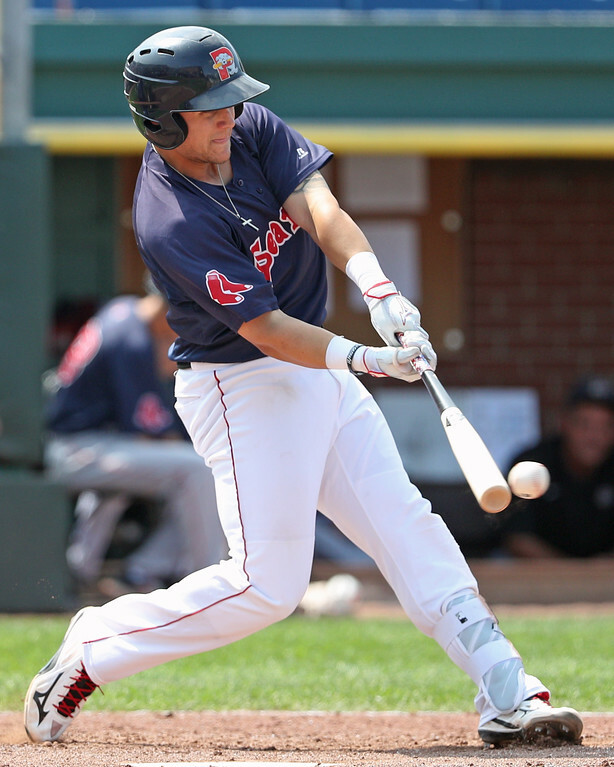 Pawtucket split a doubleheader against a New England rival, with Cole Sturgeon (pictured) picking up six hits on the day. A trio of relievers tossed 5 1/3 scoreless innings to boost Pawtucket, while a Tyler Hill triple was the key hit in a Salem comeback. PawSox mainstay Dan Butler led the way on Tuesday, ripping a pair of doubles and driving in two as part of a 3-for-4 evening. Sam Travis notched his fourth consecutive multi-hit game, going 2 for 3 with a walk. Chandler Shepherd allowed three runs on eight hits on 3 2/3 innings of work, but was able to miss bats, striking out five against only one walk. 4/17 Cup of Coffee: Of the PawSox nine hits in a victory over the Clippers, Mike Olt had four of them in a 4-for-4 showing. Two innings of scoreless and hitless relief got Kyle Martin the win while shaky pitching performances from starters Roniel Raudes and Alex Scherff resulted in losses for both Salem and Greenville. The PawSox mustered nine hits and took advantage of three Colombus errors en route to their fourth victory of the year. 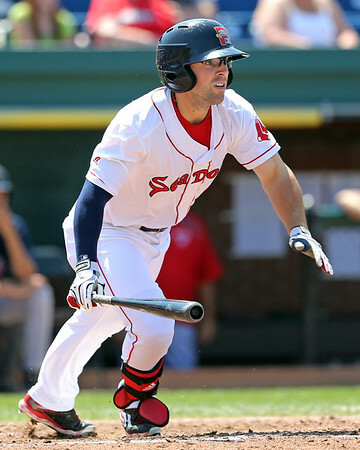 Sam Travis, Ivan De Jesus Jr., and Mike Olt (pictured, below) combined for eight of Pawtucket's nine hits, though Mike Miller made sure his lone hit counted for something as he launched a solo home run. Travis also added a home run as part of a 2-for-5 evening, but it was Olt who put on a real show, going 4 for 4 with three doubles and a home run. The offense bailed out a shaky start from William Cuevas, who allowed five runs on five hits and three walks in just four innings of work. Robby Scott allowed the final run Columbus run, and Ryan Brasier notched the save with two scoreless innings. The Sea Dogs' contest against Hartford was postponed due to rain. The contest will be made up today, as part of a single-admission doubleheader. 4/11 Cup of Coffee: With Jay Groome and Michael Chavis both on the shelf temporarily, Tuesday saw the debut of the highest-ranked active player in the Red Sox system. Bryan Mata (pictured), the precocious 18-year-old right-hander already in High A, was solid in his introduction to the Salem faithful. Portland, meanwhile, needed 13 innings to pick up its first win of the 2018 season, while old friend William Cuevas returned to the system to lead the way for Pawtucket. 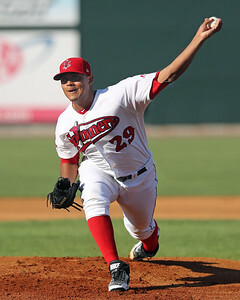 William Cuevas, a workhorse in the system from 2009 to 2016, starred in his return after spending last season in the Detroit and Miami organizations.The veteran righty scattered three hits across 6 1/3 scoreless innings, walking five and striking out two. Williams Jerez struck out two in 1 2/3 innings of relief, and Roenis Elias pitched the ninth for the save. Mike Olt, added from Portland to take the roster spot opened by the promotion of Tzu-Wei Lin, was 2 for 4 with a double. Sam Travis delivered the key hit, a two-run fifth inning single. 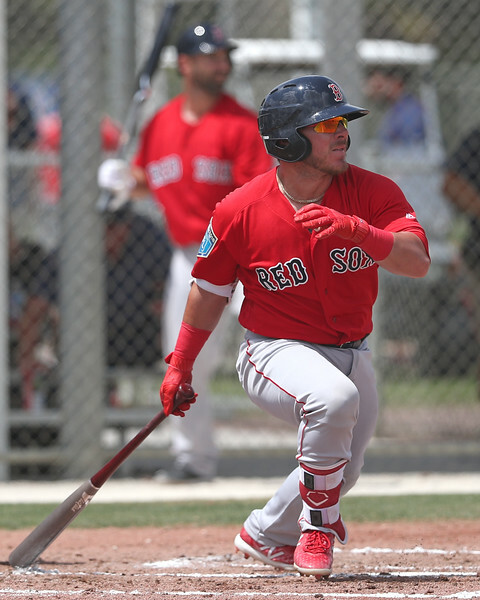 On Friday, it was announced that the Red Sox top positional prospect, infielder Michael Chavis (pictured, right), has been suspended for violating the Minor League Baseball Drug Policy. Chavis posted a heartfelt response to the suspension on his Twitter account where he said that while he is incredibly frustrated and has no idea how Dehydrochlormethyltestosterone (DHMCT) got into his system, he still supports the drug testing programs and has no choice but to accept his suspension. Chavis was due to open the season on the Portland DL, but now he will not be able to play again until the end of June. It must be so hard for Chavis, believing he is innocent but being unable to prove it. Milford, Mass native, and current Cleveland Indian Chris Colabello knows exactly what Chavis is going through after he was suspended 80 games in 2016 for the same drug, DHMCT. Colabello said to Chris Villani on WEEI that he believes Chavis is telling the truth about not knowingly having taken the drug. Similar to Chavis, the top-ranked pitcher and overall prospect on the SoxProspects.com rankings, Jason Groome, will start the season on the DL. After a very strong spring training, a mild flexor strain will initially sideline as Alex Speier of the Boston Globe first reported. The injury is only expected to cost the lefty a couple of weeks as Groome hopes to build on his form from this spring. 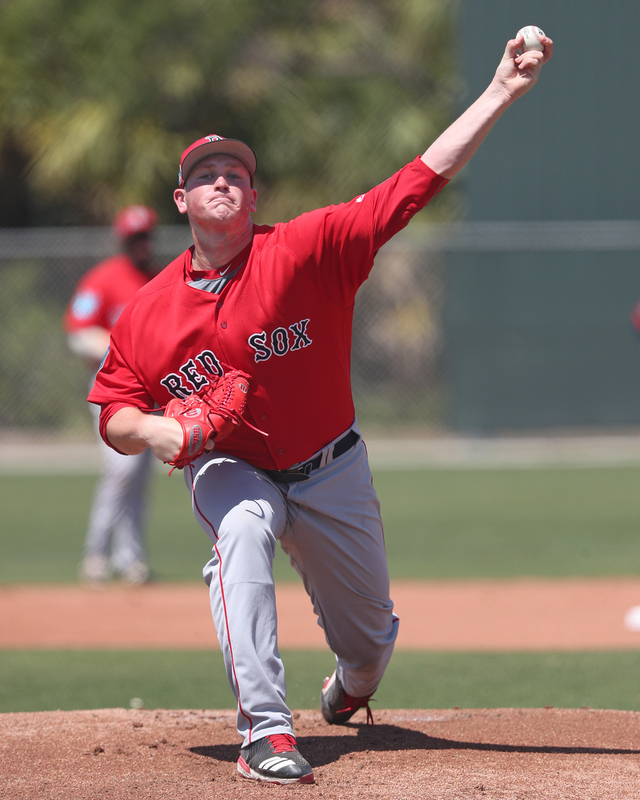 Prior to the injury, SoxProspects.com Director of Scouting Ian Cundall saw Groome pitch two innings down in Fort Myers. His three-pitch mix was on display and this year's first edition of Notes from the Field is a must read. 4/9 Cup of Coffee: It was a busy afternoon down on the farm. While the major league club was completing its comeback win to move to 8-1 on the year, a major reinforcement was prepping in Pawtucket as Drew Pomeranz got the rehab start. Two key pitching prospects made their 2018 debuts, as Mike Shawaryn got the nod for Portland and Darwinzon Hernandez (pictured, left) took the mound in the first game of Salem's doubleheader. Greenville was swept in its twinbill, despite the best efforts of CJ Chatham and Everlouis Lozada. Pawtucket's second contest of the season featured a rehab outing by left-hander Drew Pomeranz as the 17-game winner works his way back from a forearm injury. Pomeranz struggled with his control, throwing only 47 of 85 pitches for strikes while walking six batters in 4 1/3. In all, he allowed two runs on two hits, striking out one. 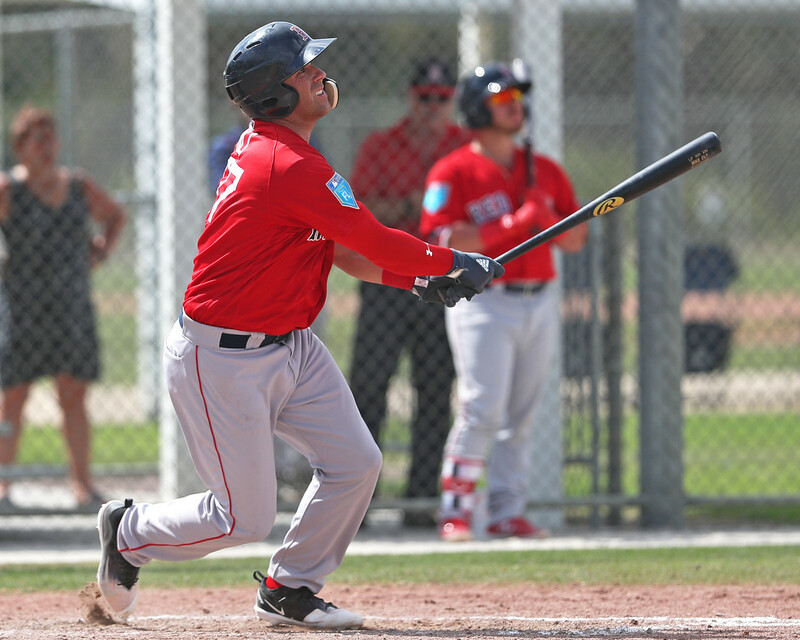 Sam Travis and Tzu-Wei Lin both picked up a pair of hits to lead the offense, while spring training acquisition Ramon Flores blasted a third-inning solo homer. 4/8 Cup of Coffee: Both the PawSox and Sea Dogs failed to get their first wins of the season while the Red Sox and Drive both had their games postponed due to inclement weather. Offense wasn’t a factor for either team in action on Saturday as both the PawSox and Sea Dogs combined for a total of nine hits and four runs. Tzu-Wei Lin and Ivan De Jesus Jr. were the only two PawSox to register a hit in a season-opening loss to the Iron Pigs, a day after their original season opener was postponed due snow. Justin Haley went just 2 2/3 innings deep into his start on a total of 73 pitches. Kyle Martin came on in relief and allowed two runs, one earned, in the fourth inning to take the loss. Roenis Elias, Robby Scott and Ryan Brasier (pictured) combined for five innings of scoreless relief. 4/6 Cup of Coffee: The 2018 minor league season is underway, and two Red Sox affiliates celebrated opening day victories. 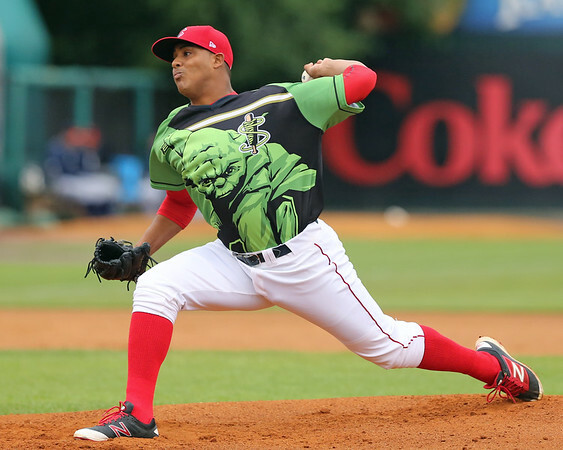 Greenville's contest was never in doubt, as a 13-hit offensive attack was paired with a masterful performance from starting pitcher Jhonathan Diaz (pictured). Salem picked up the other win on the day, hanging on for a one-run victory, while Portland had a rough transition from sunny Florida to New York's unseasonably frigid southern tier. It was a tough start to the season for Double-A Portland, shut out by their Eastern League rivals. Teddy Stankiewicz got the opening day call for the Sea Dogs for the second straight season and struggled out of the gate. The right-hander allowed a pair of home runs in a five-run first inning, including one to a former Heisman Trophy winner. 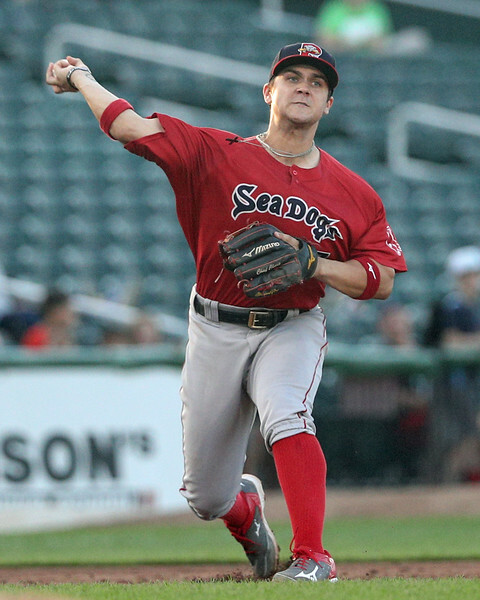 Tate Matheny collected two of the four Sea Dogs hits. 2013 first-round pick Trey Ball tossed two hitless innings in his new role out of the bullpen. Ball struck out three and walked one, throwing 24 of his 36 pitches for strikes.